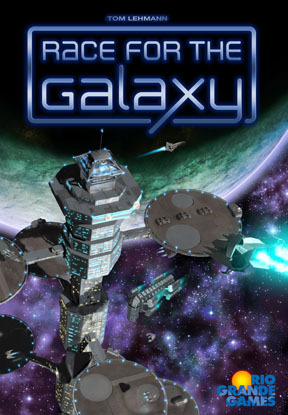 The players all compete to explore the galaxy by exploring new worlds and developing new technologies. Each turn each player chooses one action, but the others will share in the actions chosen. In the end, the player with the most points is the winner!! One of the best games of all time. Plays well with 4 players, but the special rules for a 2 player game make that enjoyable as well. It plays quick and has MANY paths to victory. You have to make the best of the cards that you get. You can't go into a game with a pre-determined strategy. I love it! My absolute favorite game right now. It is medium-light to get into the first couple of games as far as complexity goes. Say a bit more than Settlers. But boy does it pack a lot of strategy, fun and theme into such a little package. Plays well with 2 to 4. 2 player is awesome. The expansions add value as well. Plays in 30-45 minutes with multiple paths to victory. Seriously an awesome, awesome game. This game is way fun, has a lot of strategy, it took us a few times to really be able to fully understand the rules. If the game seems really easy to do every time then you are not doing it right. Great game add this one to your collection. Race For The Galaxy is based off of the game Puerto Rico, and captures certain elements of it very well, while adding a vast amount of depth. RFTG already has several expansions so you won't get tired of it. Every time I play it I get a new experience. This game is for upper level gamers. Enjoy! Played 2P three times so far, why did I wait so long? I love the different paths to victory. One game I produced and consumed the next I conquered worlds. The cards are well thought out in the way they interact and reinforce each other. The art work is also very pleasing. You need to tweak your strategy depending on what cards you get and it's a blast. Be forewarned - this great card game can be addictive. Do you have what it takes to build a space empire? This game is low in player interaction, but full of fun. I love the theme, and the quick playtime. What are you waiting for? Race for The Galaxy by getting this game! Lots of strategy for the die-hard gamer! Great mechanics and "re-playability"
The operating word in the title here is "race" - Race for the Galaxy is a fun, fast game with a lot of strategy and a lot of rules. For a card game, it is very number heavy; just look at the crib sheets, and you can see the immediate complexity of the game. Again in reference to the racing aspect of the game, there is not a lot of player interaction present in RFTG; it is nearly a 2+ player solitaire styled game. That being said it is a very good one and a very enjoyable one. Compare this game to a broader and more mathematical Citadels, without the variable player powers. I used to play a lot of Magic the Gathering, and I really like the open feeling of collectable card games. With Race for the Galaxy, I get most of that in a thematic and well balanced package that plays very fast once you have a few games under your belt. A deeper offering than San Juan, but using some of the same basic mechanics. The added depth is a true enhancement rather than pasted-on extra complexity, and works seamlessly within the system. The theme and mechanics meld together far better here than in San Juan, and the new layers of strategy are a delight. The artwork is gorgeous. Now firmly ensconced in my pantheon of favorite card games. Race for the Galaxy is one of the best card games I've ever played. It is very rewarding. Game play is quick with essentially no down time because there are no individual turns. Games usually last between 20 minutes to an hour depending on the number of players. There are 3 expansions available with each one offering many new cards, and a few new mechanics. The first expansion even introduces a solo variant. This is an excellent card game from Rio Grande and it's worth checking out! I wasn't a huge fan of San Juan, so I didn't even plan on trying this game out at all.... I heard that the icons were hard to read.... all that stuff. I'm glad that I ignored all of that and gave this game a try, because it's turned out to be (along with Saint Petersburg) my favorite tableau-building card game ever! The action-phase selection mechanic is what really makes this game something special..... you need to do a little guess work to think about what your opponent will do so that you can make the most out of their action as well. Very slick game! Race for the Galaxy is a strategy card game that has stood the test of time. Its rarest and best qualities are the high strategy/low luck factor, quick turns (due to simultaneous turns and little direct conflict), and a ton of routes to victories (especially with the first 2 expansions). I really like the name "Race" as players try to "piggyback" or "draft" off other players' decisions in order to try and pass them rather than win through direct conflict and eliminating other players. Race for The Galaxy was the beginning of the deck building card game craze. If you have played a game like Dominion or Thunderstone, this was the root of those games. If you love the sci-fi them this will be a great experience for you.